So I finished the quilt and what can I say, I love it. I used the Kikoi fabric and some of K. Fassett's stripes and juxtaposed these with Longshott Oakshott fabrics and created 9 patch blocks for which each square was cut on point. Originally I had thought to set each 9-patch block on point too but that turned out to be a little to much so I chose for a straight arrangement. The backing fabric is a large piece of a K. Fassett print from a few seasons ago that I still had in stock and which I supplemented with a few stirps of solids in turquoise, red, orange and black from a Kona and Freespirit Designer Solids. It really works well with all the colours on the front. I quilted in simple diagonal lines to give the quilt stability and used variegated Guetermann Sulky threads in two different shades. For the top a thread with more greens and for the bottom one with more orange and red. I wanted the thread the blend in rather than stand out as a white or off-white thread would have done. For the binding I wanted to use something fun and light, yet complimentary to the overall colours of the quilt so I opted for a gingham in orange and white that I ordered at Frumble fabrics. 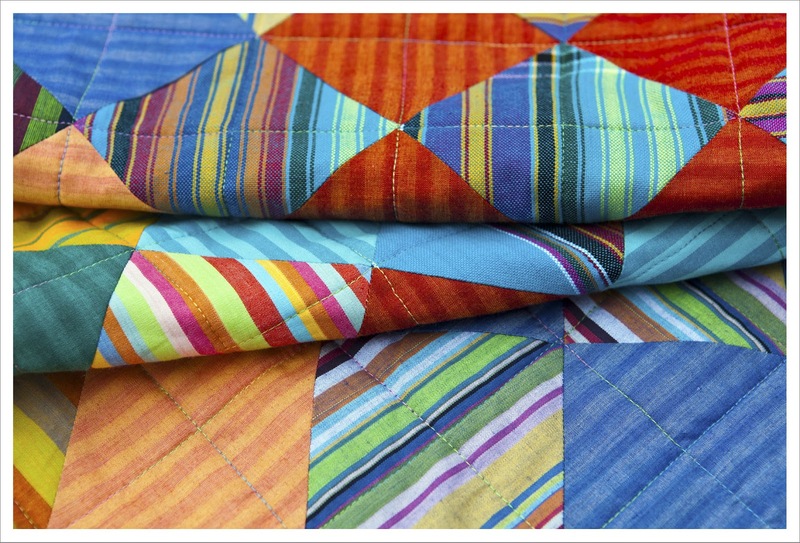 I am really pleased with the choice as it give the quilt a little lift. All the fabrics used in this quilt are woven and cutting them on the bias (or on point) was a little challenging but it worked out much better than I thought. The key was to work quickly and precise and to sew the 9-patches together speedy rather than moving the pieces about forever. The quilt measures 64" x 74" (1.63 x 1.88) which is a good sofa quilt size in my opinion. Please find previous posts on this quilt here, here and here and if the quilt is for sale in my Etsy shop. It's beautiful! A lovely finish. 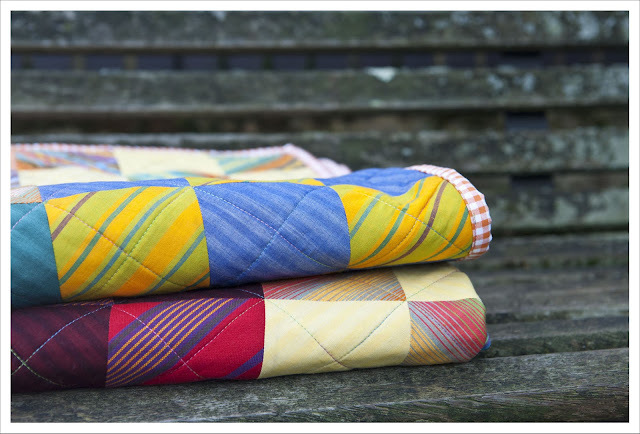 Our local shop just ordered stripes from k. Fassett. So gorgeous! 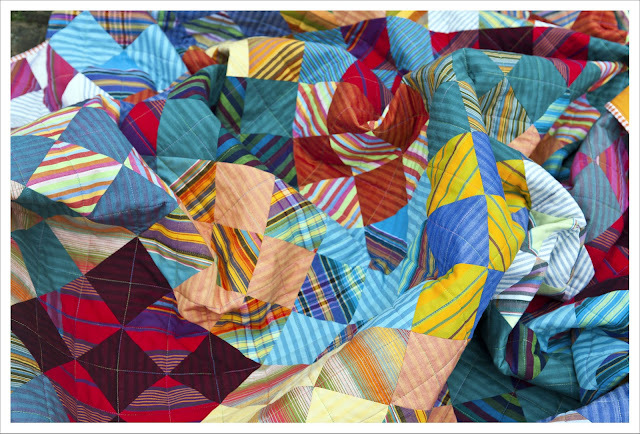 I really really love the concept, and the finished quilt looks amazing! Wow it's so nice to see something different. Love love love how this has finished up. Cutting the stripes on point was pure genius, and I love your choice of binding. 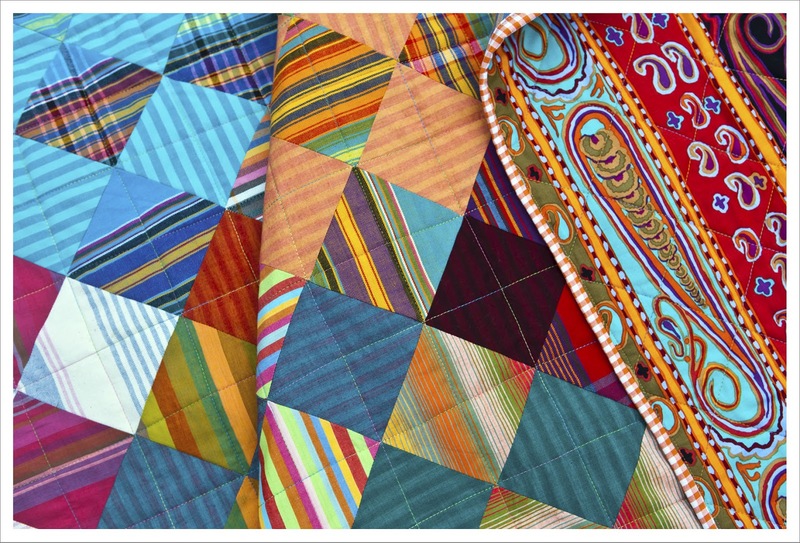 Fabulous quilt! I agree with Marg! It is so great to see a fresh, new design like yours! And that first photo is absolutely brilliant! Its gorgeous Judith, really lovely. This is sooo bright and cheerful! love it! I love how it turned out. Great picture of it, too! Enjoy it! 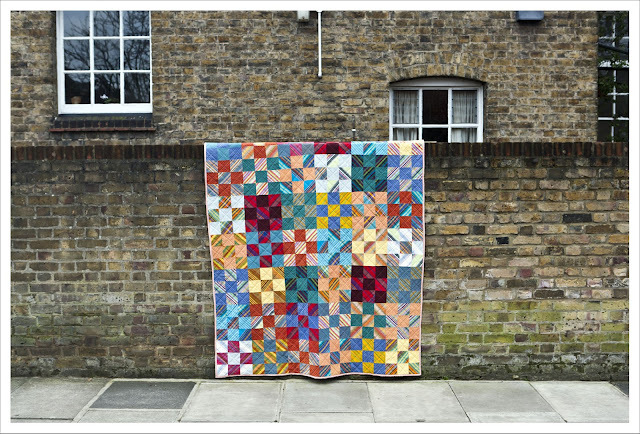 Not only is this quilt lovely, but your photos are so bright and beautiful, I just want to crawl inside and snuggle with that quilt!